Cross River, Nigeria: March 21, 2017. 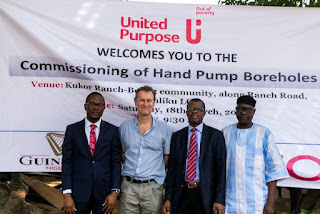 In furtherance of its continued commitment to interventions that transform lives and improve the health and well-being of communities in Nigeria, Guinness Nigeria Plc has constructed seven hand pump water boreholes in Bebi Community, Obanliku Local Government Area (LGA) of Cross River State. The donated boreholes (which will provide more than 7,000 persons with year-round access to safe drinking water) were unveiled at a commissioning ceremony which the company held to mark this year's 'World Water Day'. "The boreholes we are commissioning today are the latest addition to the range of water projects Guinness Nigeria has delivered in states across the country as part of Diageo's flagship 'Water of Life' programme. Since 2007, our 'Water of Life' programme has provided clean drinking water to over 10 million people in 18 countries in Africa. Under the aegis of the 'Water of Life' programme in Nigeria, water facilities have been constructed in 35 communities across the country. We are pleased to note that through these water projects, Guinness Nigeria has helped over 1.5 million Nigerians access clean water and ultimately improve their overall health and wellbeing. Also speaking at the ceremony, Mr. Dan Ebri, Director of Water at the Cross River State Ministry of Water Resources, commended Guinness Nigeria's commitment to initiatives that promote access to safe drinking water in Nigeria. He said: "I commend Guinness Nigeria's commitment to interventions that tackle the challenge of water scarcity in rural areas especially in Cross River State. I also thank the company for partnering United Purpose to deliver programmes that have helped Obanliku LGA to achieve 'open defecation free' status. The impact your partnership has made is laudable". The clan head of Bebi Eastward in Obanliku LGA, His Royal Highness Atung Francis, also expressed the community's profound appreciation for the donated water facility. He observed that prior to the donation, community members trekked to the hilltop – a distance of about three kilometres-to fetch water. Guinness Nigeria's latest intervention in Obanliku LGA comes on the heels of a previous pilot project which facilitated the construction of ten boreholes in rural communities in Cross River State's Abi, Bekwarra, and Obanliku LGAs. The pilot project (which was also delivered in partnership with United Purpose) helped over 11,000 people in these LGAs to access safe drinking water, and trained 120 community members on basic borehole maintenance and water resource management. In his remarks at the commissioning ceremony, the Country Director of United Purpose, Nigeria, Mr. Tim Connell acknowledged Guinness Nigeria's contributions to the SWISH programme in Cross River state he said: "I am pleased to see the positive impact we have been able to make in Cross River State partnering Guinness Nigeria. Today Obanliku LGA has become the first LGA in Nigeria to achieve 'open defecation free' status, and more persons in the local government area now have access to clean drinking water. I would like to thank Guinness Nigeria for its contributions towards these milestones"
Guinness Nigeria's Water Sanitation and Hygiene Interventions in Cross River State have been delivered under the aegis of the 'Safe Water and Improved Sanitation and Hygiene' (SWISH) programme the company has been implementing in collaboration with United Purpose. 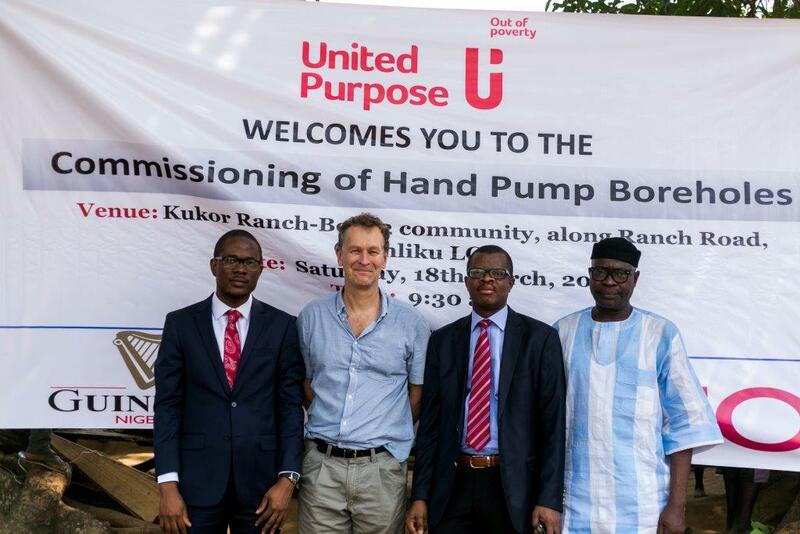 United Purpose is the executing agency of the 'Rural Sanitation and Hygiene Promotion in Nigeria' (RUSHPIN) programme, a five-year initiative of the UN's Global Sanitation Fund and the Nigerian government, which uses the empowering 'Community-led Total Sanitation' approach to trigger community-wide demand for improved sanitation and hygiene without the use of external subsidies. Through the RUSHPIN programme, over 2 million rural people in Cross River and Benue states are taking control of their own health by ending open defecation and washing their hands with soap at critical times. It would be recalled that last year, Guinness Nigeria commissioned water facilities which it constructed in Gwam, Bauchi state (in partnership with Water Aid) and Tyowanye, Benue State (in partnership with OXFAM). These water schemes are currently providing safe drinking water for over 20,000 people living in beneficiary communities.